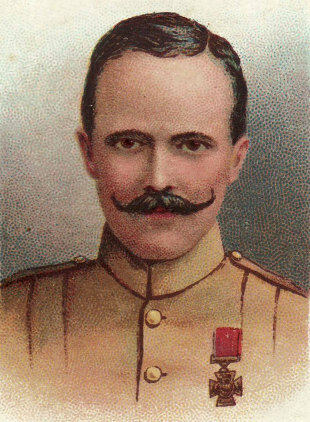 Major Robert Johnston, who played twice for Ireland and three times for the Lions, is one of only four rugby internationals to win the Victoria Cross. Both his appearances for Ireland came in 1893 and he was picked to tour South Africa with the Lions in 1896 - the tour party also included Tom Crean, another Irish VC winner. Like Cream Johnston decided to remain in South Africa after the end of the tour where he played for Transvaal. When the Second Boer War started he and Crean joined the Imperial Light Horse and he was his VC at the Battle of Elandslaagte. The citation read: "On the 21st October, 1899, at Elandslaagte, at a most critical moment, the advance being momentarily checked by a very severe fire at point blank range, these two Officers very gallantly rushed forward under this heavy fire and rallied the men, thus enabling the flanking movement, which decided the day, to be carried out." Johnston returned to Ireland in 1911 where he joined the prison service.